High waisted skirt, over knee height. New collection! 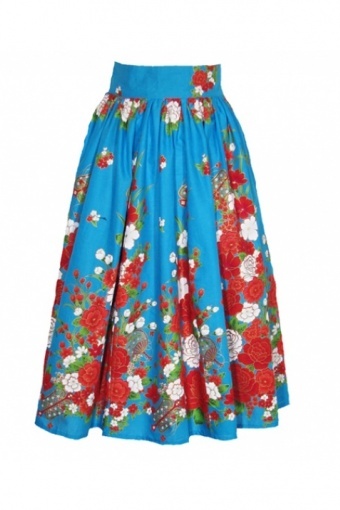 Belle skirt Chinese Flowers blue from Collectif. This is a real cutie! 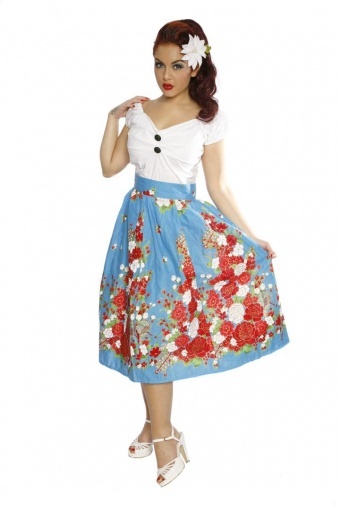 High waisted A line skirt which accentuates your waist! Pleated at the hips and over the knee height. Small waist band with button and zipper. Beautiful Chinese Flower coton print in turqoise blue with red and white peony's and gold accents. Made of coton (no stretch), after washing the fabric will be smoother. Dress is up or dress it down, this one is so versatile!